Components perfectly matched to each other, expert planning, design and manufacturing – by ordering a roll shop from Herkules, customers obtain the complete solution from one single source. 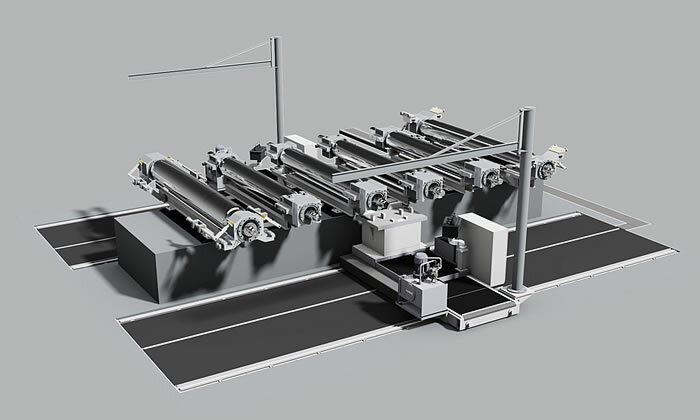 From the individual roll shop component to a fully automated roll shop, Herkules offers the complete line-up of possible choices. In close cooperation with you, Herkules plans your roll shops and delivers them on a turnkey basis, if requested. Following a detailed analysis of your requirements, Herkules experts develop a concept tailored to your machining capacities. Apart from roll grinding and texturing machines, Herkules offers a comprehensive range of roll shop equipment to handle rolls, such as chock changing devices, chock tilters, roll transfer cars, loaders and much more. Each roll shop component is designed and manufactured entirely in-house at Herkules. By the help of the Roll Shop Management System (RSMS) made by HCC/KPM, a company of the HerkulesGroup, all components in the roll shop can be integrated for data collection purposes as an option. Upon request, the Roll Shop Management System with Automation (RSMA) fully automates all processes. 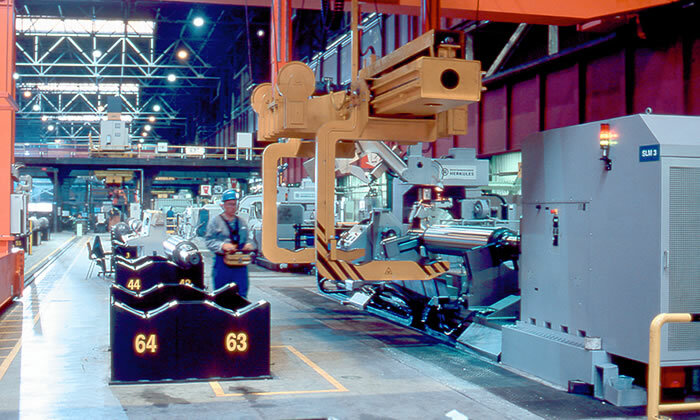 Following the first roll shop in 1984, Herkules has delivered numerous automated roll shops to customers across the world. You can also benefit from this comprehensive know-how! Herkules offers the full spectrum of accessories for your roll shop. Herkules is happy to advise you on the solutions available and how they can be put to your advantage. for loading and unloading grinders and texturing machines. 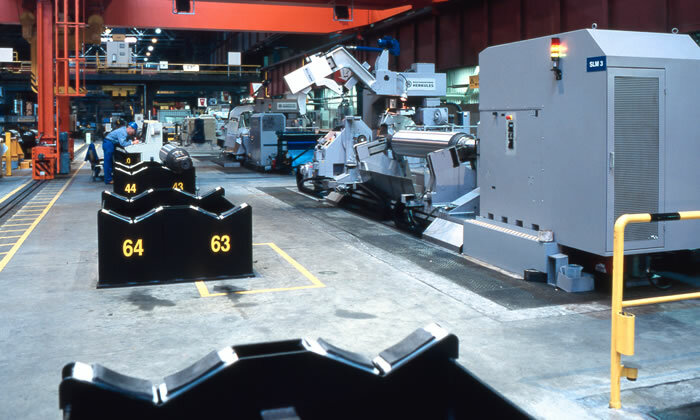 Loaders are an important part of a fully automated roll shops. Adapted to the conditions of the specific environment, they feature a portal or semi-portal design and allow for the accommodation of rolls with or without chocks. Their gripper systems can be automatically adjusted to different roll types, if required. for efficient chock removal. Roll racks are stationary. Their number depends on the number and type of roll stands. 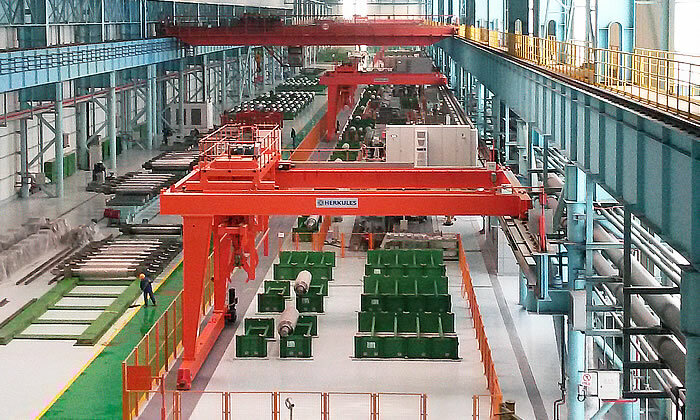 Operators remove the chocks from one or two sides simultaneously with special cars. Travelling cranes can help handling the chocks. Solutions for rolls of up to 30 tons (with chocks) have already been implemented by Herkules. with a stationary middle rack. Depending on the requirements and the roll bearing it is equipped with a rotary drive. Two-side extraction cars, equipped with spacious operating platforms, remove chocks in longitudinal direction of the roll axis. Using special adaptors, work or vertical rolls can also be handled with these dechocking devices. As an option, additional stationary operating platforms are set up near the roll body in order to facilitate inspections of the roll barrel. Herkules dechockers are already in use for complete sets of back-up rolls at a plate mill with chocks of up to 260 tons. include several platforms that are perfectly adapted to individual roll types. Both back-up rolls and work rolls can be accommodated. The combination chock changing devices are also available with equipment for roll rotation for individual roll stands with specific roll types. Special solutions, such as roll transfer cars that can be integrated in the chock changing device, are available as well. In this case, chocks are directly mounted or dismounted on the transfer car. The specifications of devices built by Herkules so far: maximum weight of the complete roll with chocks approx. 80 t.
for inspection, mounting and dismounting of chocks in a safe and user-friendly position. The chock, which is placed on the tilter with the shop crane (weights up to 50 t are manageable), is swivelled by 90 degrees with a tilting device. Special solutions with manual operation are also available in case only small, light chocks are to be swivelled. for moving the roll between the stand and the roll shop, in case these areas are located in different shops or shop wings. The car shifts back-up rolls with or without chocks and work rolls, also in pairs with chocks, as well as complete roller cassettes. The Roll Shop Management System (RSMS) by HCC/KPM integrates all roll shop components into a complete information network – from grinding machines to chocks, bearings and grinding wheels. Based on the data collected, the RSMS automatically creates an overview of all registered components and their production cycles. On the fully equipped main computer various graphics, data and statistics are displayed. You can keep track of stocks or fixed dates. This way, you obtain various information and structured data for informed decision-making and planning. 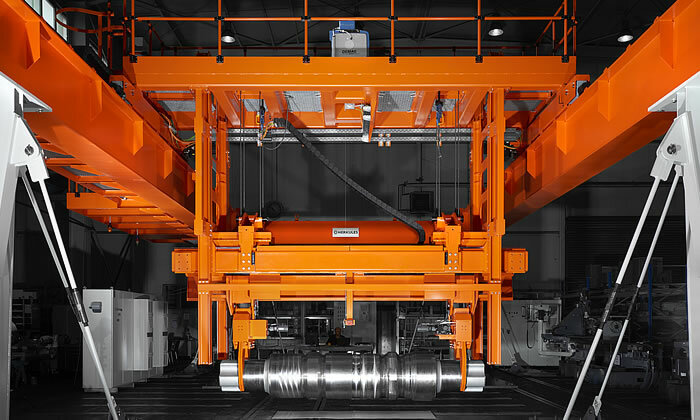 Optionally, the RSMS is supplemented by the "Roll Shop Automation" function. This version manages the entire roll shop automatically – the loader automatically loads and unloads the machines and operation processes are automatically started. On this highest level, RSMS guarantees the most efficient functioning of your roll shop.